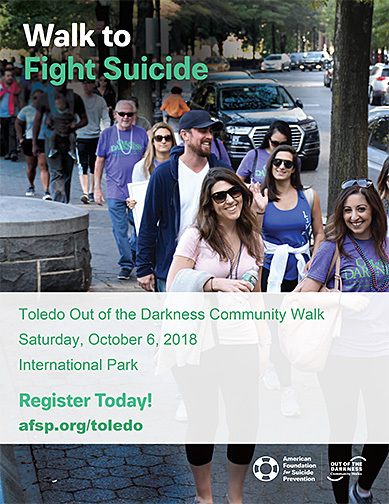 The University of Toledo Psychology Clinic is a gold sponsor of the Out of the Darkness Walk, the American Foundation for Suicide Prevention’s annual Toledo Walk Saturday, Oct. 6. The walk is intended to raise awareness on suicide and depression; reduce stigma; and support research and education. “Suicide is quite relevant to society and universities, and the Psychology Clinic believes this outreach and involvement is important,” said Dr. Jason C. Levine, UT associate professor of psychology and director of the Psychology Clinic. The Toledo walk will start at 11:30 a.m. at Promenade Park in downtown. Registration is free and will begin at 9:30 a.m. Donations are welcome. Participants can choose between a 1-mile or 3-mile walk. Out of the Darkness Walks are community events held all across the nation in order to raise awareness for the American Foundation for Suicide Prevention. This year there will be 425 community walks with an expected turnout of 275,000. Click here to make a donation to the American Foundation for Suicide Prevention. This entry was posted on Wednesday, October 3rd, 2018 at 3:26 am and is filed under Arts and Letters, Events, UToday .